Lim Shujuan, Pauline Ang and Sushma Goh. 2015. The making of National Gallery Singapore, National Gallery Singapore press. What do we demand from museums and what responsibilities do they have to civil society? 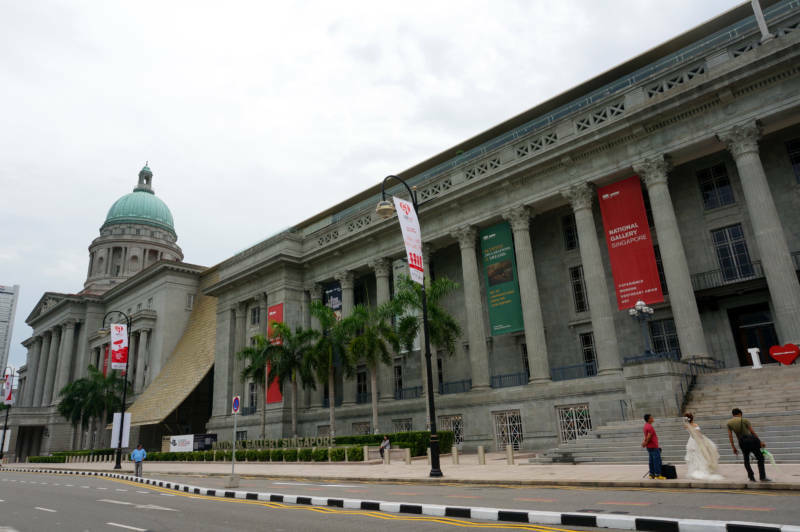 The opening of the National Gallery Singapore (the Gallery) on 24th November 2015 coincided with the country’s 50th anniversary of independence. It was timely as the occasion for the city-state to critically reflect on the relationship between art and the cultural identities of Singapore. This essay examines the potential and possibilities of the Gallery, where cultural debates that coalesce and matter can take place within a network of civic institutions that play a critical role and responsibility in civil society. 2015 was a historically significant year for Singapore as it marked its 50th year of independence. 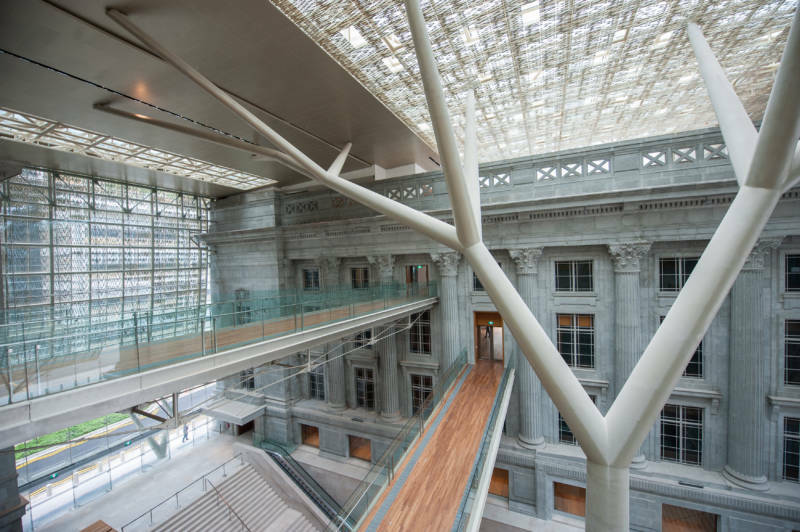 The opening of National Gallery Singapore (the Gallery) on 24th November 2015 was timely as it provided an occasion for the city-state to critically reflect on the relationship between art and the cultural identity of Singapore. The Gallery opened with two long-term exhibitions: Siapa nama kamu? Art in Singapore Since the 19th Century, and Between Declarations and Dreams: Art of Southeast Asia since the 19th Century, with both exhibitions together featuring over 800 artworks drawn from the National Collection (under the custodianship of the National Heritage Board), as well as loans from museums and private lenders. Two years since the Gallery opened, its Director Eugene Tan (陳維德), in an interview with The Paper asserted that “The art museum must transform to become a platform for discussing controversial social and cultural issues.”(remark 1) The Gallery has a civic vision is a discursive site where important cultural debates can take place within a network of civic institutions that plays a critical role and responsibility in the civic arena. In the relative absence of platforms for open discussion on contentious topics, art has the potential to provide Singapore with a much needed discursive space where these issues can be engaged imaginatively. The vision of the Gallery as a civic institution that resonates with the exhibition title, Siapa Nama Kamu?, which means “what is your name?” in Malay. There are two reasons for this: The first is how the exhibition title is framed as a question, a provocative curatorial gesture that seeks to activate the passive audience to redefine and rethink their own currently held assumptions and conventions. Second is the power of naming and being named. Our names are inseparable from our cultural and personal identities, which are in turn connected to our language. Asking this question in Malay –Singapore’s national language, but a national language that is still not taught to all Singaporeans in a country, with a Chinese majority population –reframes the question of what is our Singaporean identity. The adoption of Malay as the national language could be traced to the construction of a Malayan identity which was desired through the 1950s until 1965, ended abruptly when Singapore left Malaysia and became an independent country. The unfamiliarity of the exhibition title in Malay produces discomfort as a curatorial strategy to provoke the spectator to think critically. It is for these reasons that the exhibition Siapa Nama Kamu is used as an entry point to understand the vision of the Gallery as a civic institution with a role and responsibility to engage with social and cultural issues that matter. The title of the exhibition, Siapa Nama Kamu was derived from Singaporean artist Chua Mia Tee’s National Language Class, which was painted in 1959 and features prominently in this exhibition. 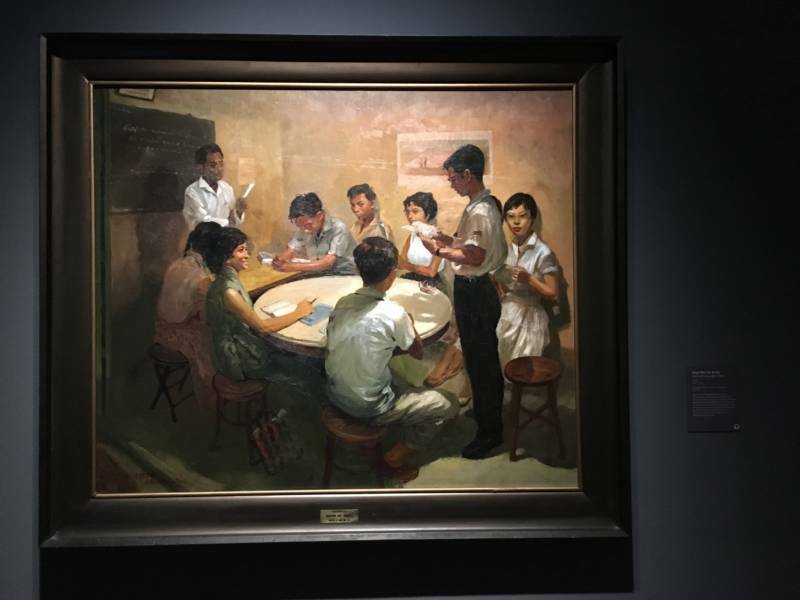 This painting depicted a class of Chinese students learning the Malay language from a Malay teacher who stands in front of a blackboard with the phrases (Siapa nama kamu? ), and di mana awak tinggal (where do you live?) scribbled on it. 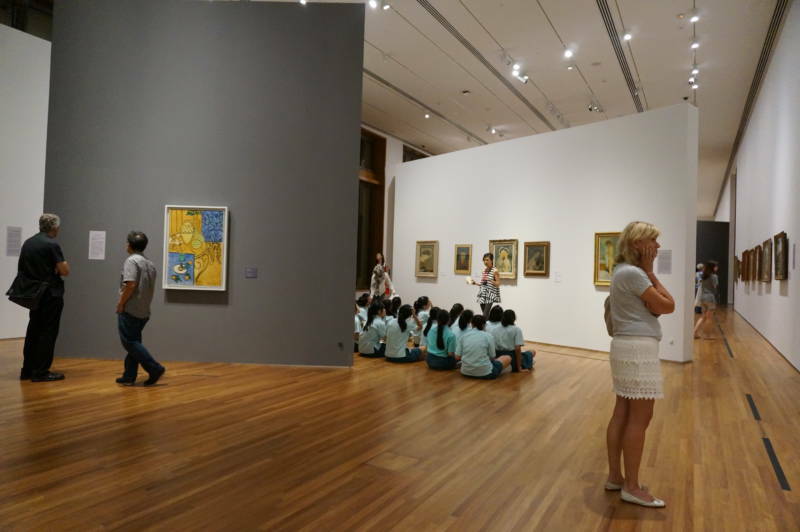 The power of naming and place-ness are useful entry points to understand the curatorial and research directions of National Gallery Singapore. To ask one’s name in Malay refers to the historical moment when the idea of a Malayan culture, which included Singapore, the Malay Peninsular and the Borneo territories of Sabah and Sarawak, was desirable within the context of decolonisation and the rise of new Southeast Asia nation-states.. The reference to Malay as Singapore’s national language, oneborne out of the region itself offers both a critical reflection of why Malay is not taught and used by all Singaporeans regardless of ethnicity, and a perspective on art history that is not circumscribed by the nation-state, but open to the cultural confluences both within and without it. (remark 2) These questions provoke the Gallery’s audiences to consider how personal, national and regional identities, and histories intersect with the 19th century as an important art historical break that marked the beginnings of modernity and modern art. Figure 3: Chua Mia Tee, National Language Class, 1959, Oil on canvas,112 x 153 cm. The idea of place-ness is alluded to in the other phrase: di mana awak tinggal (where do you live?). It expands Singapore as a geographical concept to invite new ways of thinking about and making art that destabilise Eurocentric approaches. Reframing Modernism, the Gallery’s inaugural international exhibition in 2016 co-organised with the Centre Pompidou, exemplified the Gallery’s commitment to connect the art histories of Southeast Asia and Europe. 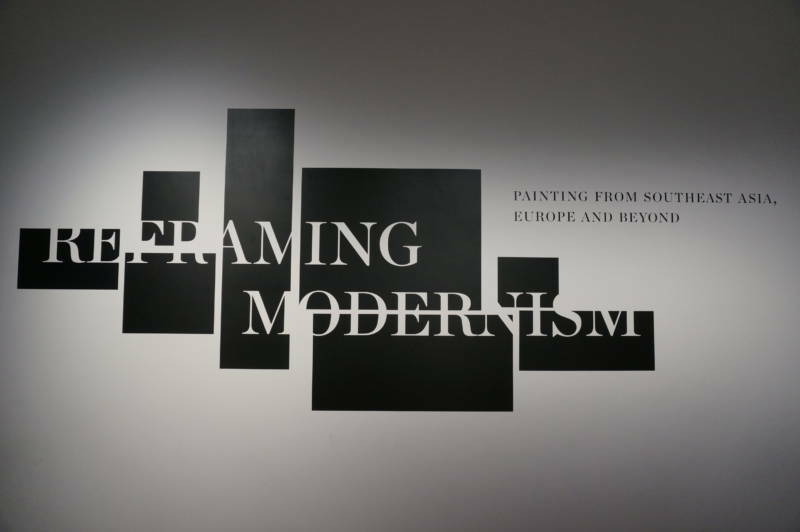 It adopted an artist-centric approach to forge stylistic and conceptual resonances that rethink and reframe modernism as a linear progression of styles that necessarily privileges the origin centred in Europe. This ambition to chart new research and art historical directions that imagines the world as a constellation of art historical linkages is physically manifested in the Gallery’s collection of Southeast Asian, where these resonances and connections can be made. Besides exhibitions, the Gallery has embarked on publishing important art historical research on art in Southeast Asia. Charting Thoughts: Essays on Art in Southeast Asia is a research publication of newly commissioned essays by scholars who have written on Singapore and Southeast Asia as a region, which highlights the limitations of Euro-American frameworks such as the modern as a break with tradition that overlooks cultural continuities that still shape both modern and contemporary art practices here. Eurocentric perspectives are also blind to the histories of cultural transfer and the process of such translation and cultural hybridity that invests in and is mediated through the region with agency that challenges the inequalities of influence that privileges the West as the origin. The transformative potential of art is realised in the Gallery’s education and public programmes. The Keppel Centre for Art Education (KCAE) focuses on self-led learning and exploration in immersive spaces that encourage children to fulfil their creative and imaginative potential through play. A variety of imaginative spaces introduce artistic practices like print-making and ceramics to children as young as five years up to learn about these art forms interactively. 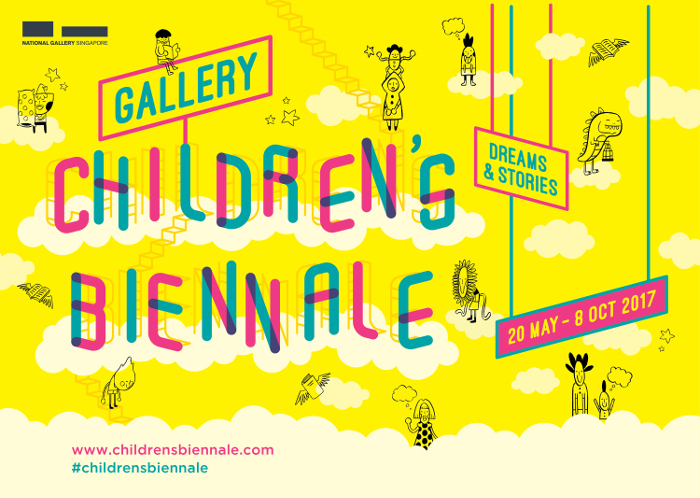 The Gallery Children’s Biennale is a series of programmes that involved commissioning artworks by contemporary artists. 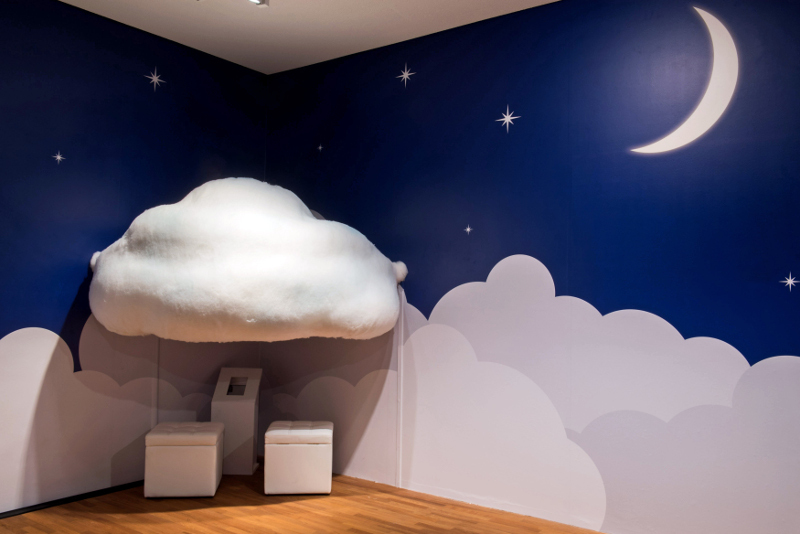 An example is Lynn Lu’s Duplet, where family and friends can sit together under a cloud to answer questions posed by the artist as a way to understand interpersonal relationships. These public and education programmes provide varied ways in which the role of the museum as a civic institution can be realised alongside exhibitions and publications. From 10-12 November 2017, the Gallery will be hosting the International Committee for Museums and Collections of Modern Art (CIMAM)’s conference on “The Roles and Responsibilities of Museums in Civil Society”. This brings us full circle to Director Eugene Tan’s proposition of the Gallery as a platform where contentious social and cultural issues can be discussed in the public sphere. Will museums move towards realisation as civic institutions with a responsibility towards the empowerment of socially engaged communities, or will they remain detached and non-involved in civil society? Whichever the direction museums may take, it is critical that all museums are institutionally self-aware of the roles and responsibilities they stand for in a fractured world increasingly infected by inequality, and intolerance of difference. © 2019 - 中華民國博物館學會 版權所有.